If you have jumped in the AMP wagon and took a look at the metrics, you may be asking yourself why your AMP pages have a higher than normal bounce rate. AMP carries with it an ecosystem where you are no longer the one serving the content, with a lot of implications in terms of measuring it. In this post, I explain you, with the highest level of detail, what the problem is, what is it caused by and how can it be solved. 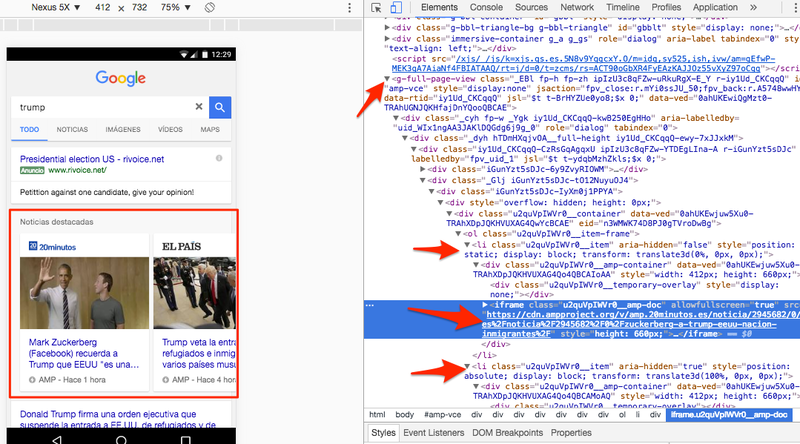 1.2 How are AMP pages served, after performing a search on Google? 2 How AMP works, regarding Analytics? 3 Why AMP analytics data lies? 4 How to avoid Analytics duplicating users with AMP? 5 What happens with historical data? Before going deeper, let’s understand what AMP is all about. 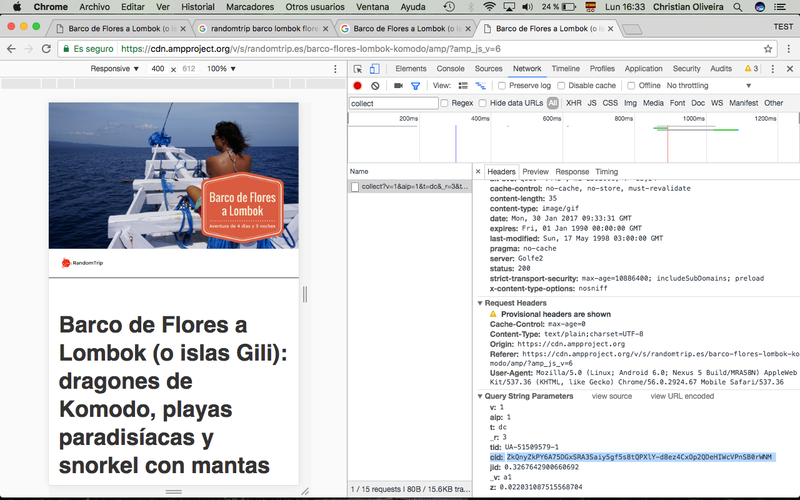 AMP (Accelerated Mobile Pages) is an open-source project, led by Google but supported by other partners (Pinterest, Twitter, Linkedin…) that is trying to define a standard to create faster pages for mobile devices. As, even with the resources, companies (in general) haven’t really tried to create faster mobile web pages, and the main cause of the slow load speeds are ads and the use of JS, Google (and Facebook) have decided to define new standards with lots of restrictions so, whatever you do, pages will load really fast. 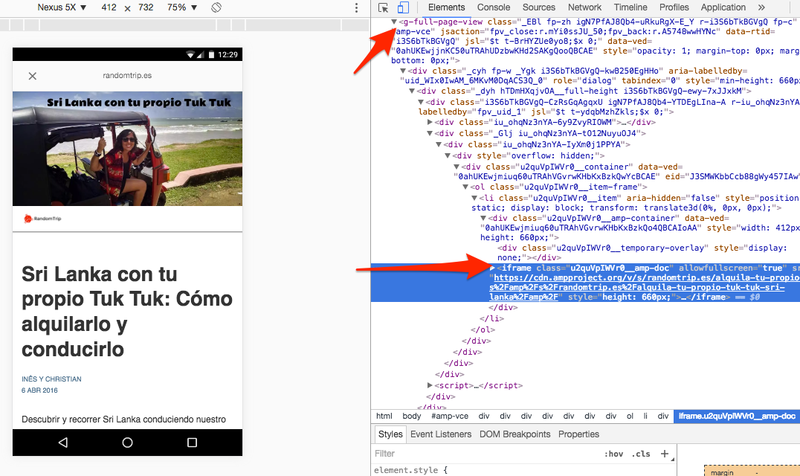 In both cases, besides limiting the html tags and elements that you can include (JS, CSS, ads…), both platforms save a copy of your AMP/Instant Article content so they can serve it directly from their servers. How are AMP pages served, after performing a search on Google? In Google’s specific case, when a user clicks on any of the AMP results (those with the icon and the AMP label), the content is loaded inmediatly, without leaving Google’s SERP. Once the crawler detects in the “common” URL the amphtml tag, it crawls the AMP URL and validate if it complies with the AMP guidelines. If that’s the case, then the AMP page is cached and asigned to the “common” URL. Besides that, as the AMP URL has (or should has) the canonical tag pointing to the “common” URL, it shouldn’t be indexed separately. 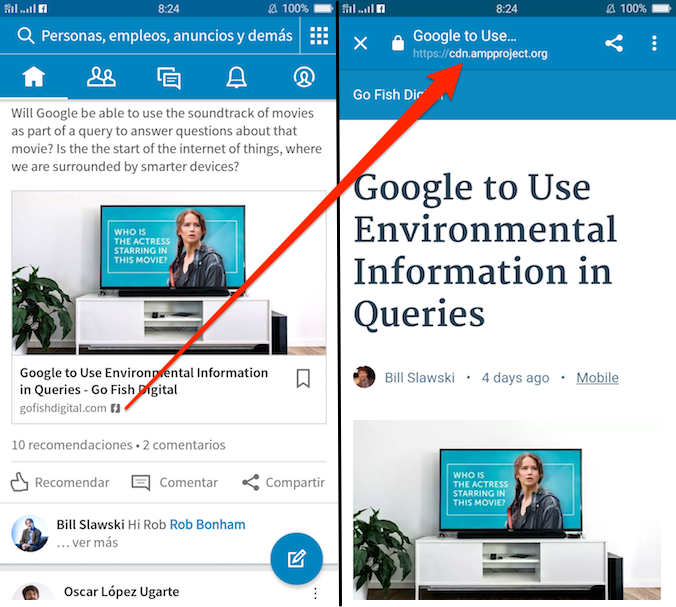 When a user performs a search from a mobile device, if a result doesn’t have AMP version, clicking the result will open the “common” URL in the browser. The domain server is contacted and the client’s browser receives the page (this is the common behaviour for any web page). 1. 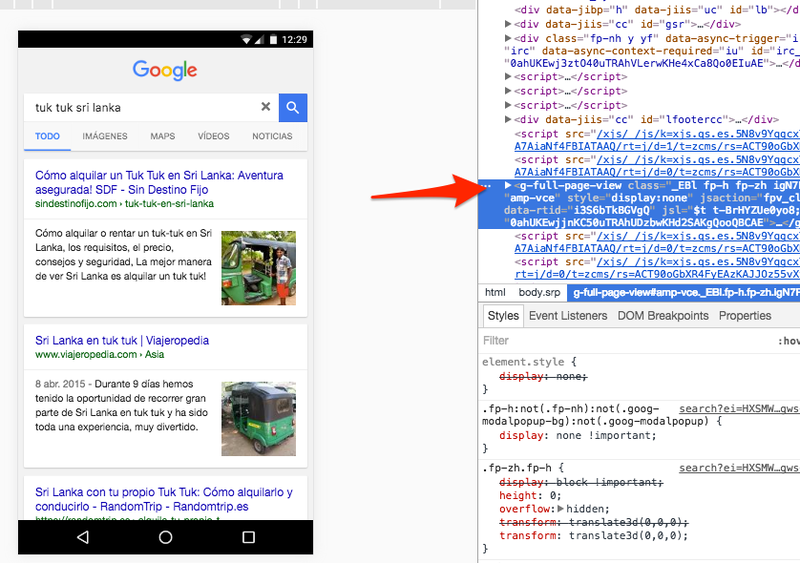 The SERP’s html already contains a div element that will display the content of any AMP result. This is the div that will display the content of the AMP results, if any of them are clicked. 2. After clicking on an AMP result, several elements are loaded inside that div. One of them is an iFrame. This entire layer will load the content directly inside it, without leaving the SERP. 4. If the user, after opening an AMP result, closes the article using the X up left, the layer is closed and he/she can continue navigating through the results. If the user clicks on any internal link inside the AMP content, he/she leaves the Google environment and the “common” URLs is loaded in the browser. How AMP works, regarding Analytics? 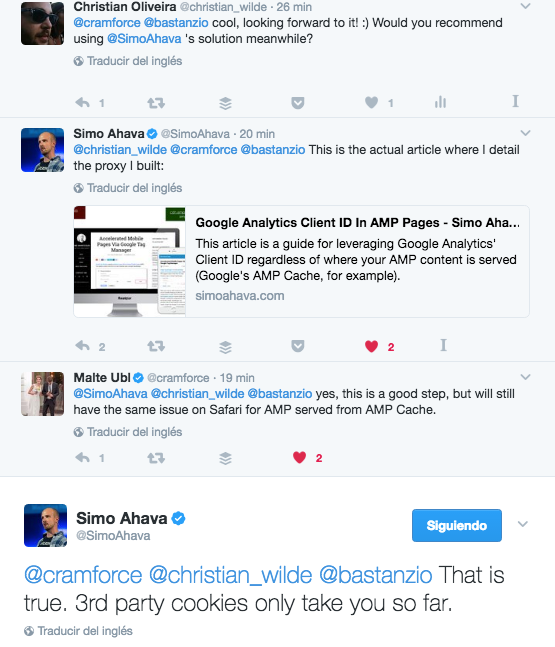 AMP pages are served by Google, not by our server. Our server doesn’t even know that a page has been served to a user. If we perform a log analysis filtering AMP URLs in our server, we’ll probably see that the traffic pattern has nothing to do to what Google Analytics shows (or your Analytics tool). In fact, most of the hits will be from Googlebot. Accessing directly to an AMP URL in your broswer. As Google is the one serving the pages, from his servers, the domain serving the pages is not our original domain, but one he decides. Right now Google is using cdn.ampproject.org (sometimes also yourwebsite.cdn.ampproject.org), using an iFrame loaded directly inside the SERPs. This has a lot of implications regarding analytics, as the analytics code is being executed in a different domain and so, it can’t read the cookies of the original domain. A user that visits one of our AMP pages through Google, and a non-AMP page through any method, is counted as two visitors. A visit that starts in an AMP page through Google and continues with an internal link to a non-AMP page, is counted as two visits. The bounce rate (measured by default) of an AMP page is 100% unless there are several AMP results from our domain in the SERP and the user visit several of them in the same session. Below, all of these cases are reproduced and investigated step by step. 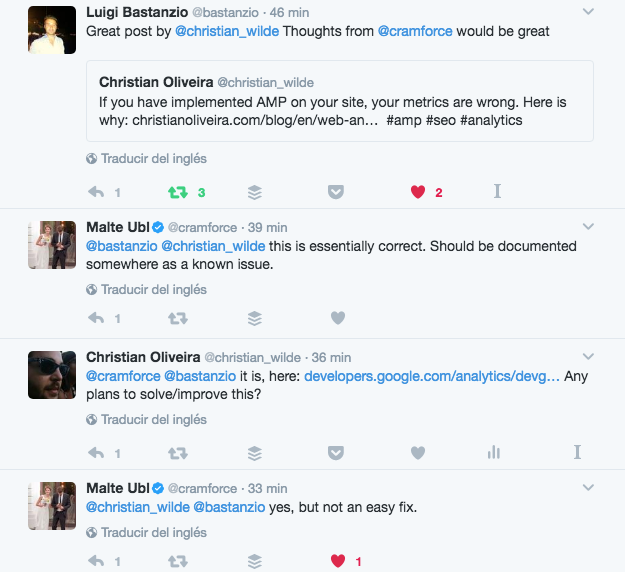 Why AMP analytics data lies? The term “unique visitor” is getting more and more false day by day. Users using different browsers, different devices and private/incognito options (or manually deleting the cookies) makes identifying a real user through a cookie impossible. So what happens with AMP? There are different cases, depending on where the content is loaded, and, in some cases, the order of visiting each of the scenarios (all of the cases explained here refer to the use of a mobile device). 1. User access our website through his mobile browser. This is the most typical use-case for accesing our website: someone wants to check our website, and types our URL directly in the browser (or through favorites, or through Google Search). To decide if a user is new or not, Google Analytics checks the “_ga” cookie. If it exists, the JS obtains the “clientID” value from it and send it to GA servers. If not, it creates the cookie along a new “clientID” in order to identify the user in the future interactions. In this case, while doing the test, we are using a new “user” in Chrome so we don’t have any cookie set yet, and so a new one is created. When accesing the website directly, Google Analytics’ behaviour is the “normal” one. A clientID is generated and stored in the _ga cookie, and the value sent to the GA servers. 2. User access directly to an AMP page: this case, generally, will not be common (unless we share/link our AMP URLs, or implement our mobile website directly with AMP). 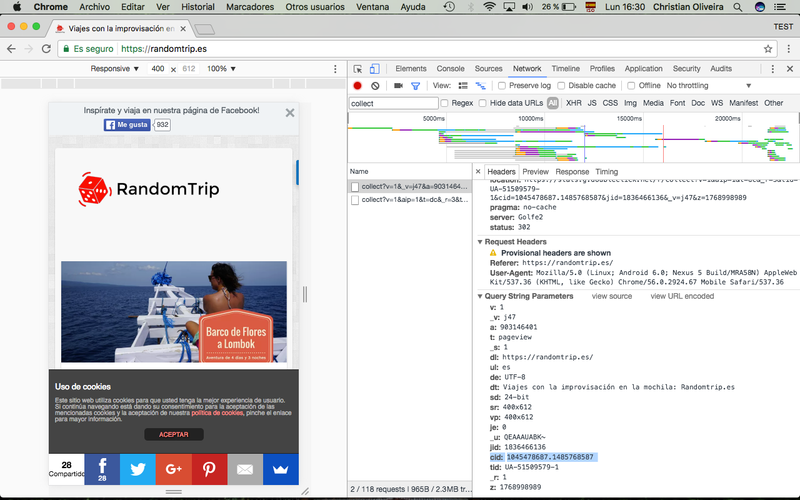 We are still in our domain (randomtrip.es), and so, the GA code should be able to access the previous cookie (_ga) and know that we are still the same user, right? 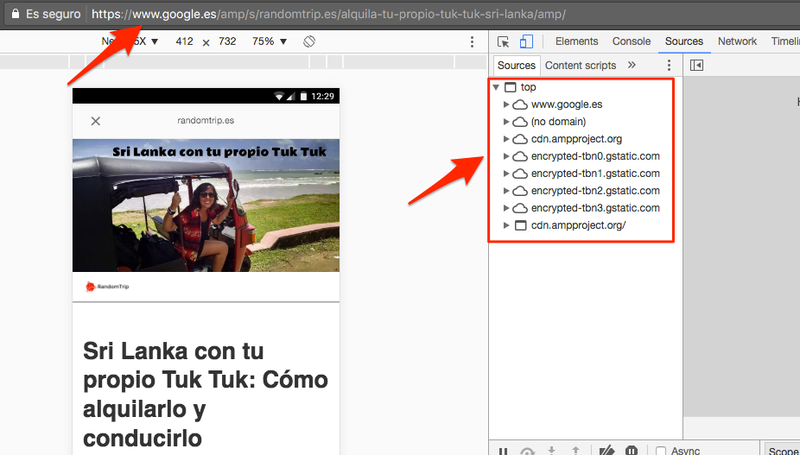 Even loading an AMP page inside our same domain (randomtrip.es) where a _ga cookie already exists, GA identify us as a different user. Why? What happens here is that Google Analytics’ AMP JS uses a cookie indeed, but the one it uses (AMP_ECID_GOOGLE) is different than the cookie GA uses in non-AMP pages (_ga). So, clientID is different in this case, and this two sequential interactions would result in two unique visitors with two individual sessions. 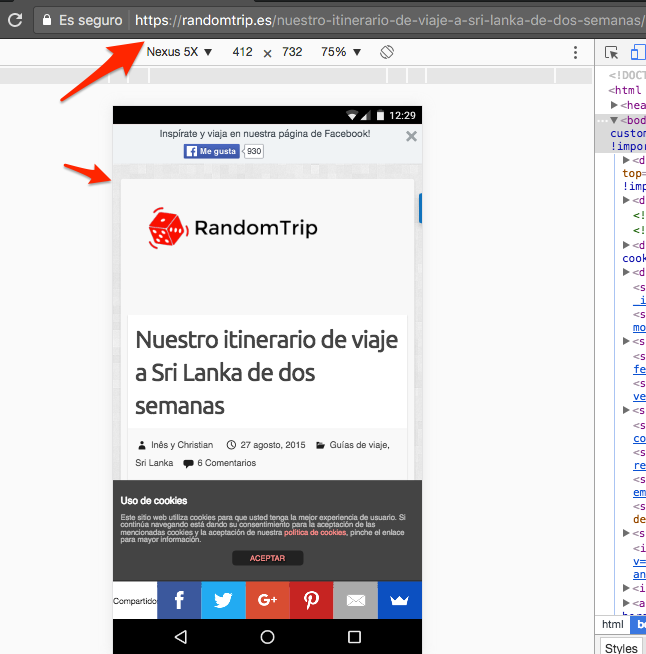 Content is loaded through Google’s AMP Cache, inside Google’s domain (let’s say google.es) through an iFrame that points to cdn.ampproject.org, and the user identification information (the clientID) is saved in the LocalStorage for the google.es domain, instead of in a cookie (it doesn’t use _ga cookie, nor the _AMP_ECID_GOOGLE cookie). The value stored there is unique and, of course, different from the previous values in the cases 1 and 2. While accesing this AMP result from Google SERP, this is the clientID sent to GA, different from the two first ones for the same website. So, we (I) are already three unique visitors, with three different sessions! In this case, the method used by GA is the same than in the previous case (the LocalStorage, not the cookie) but it uses instead the LocalStorage for the subdomain cdn.ampproject.org, so the value stored for the clientID is, again, a new one, different from all the other cases. We have our forth clientID, for the same website, using the same browser and without deleting cookies. This would be our 4th clientID for the same website! 5. User access directly to the URL Google shows when clicking an AMP result: this case is common as it happens when a user gets to an AMP page through Google and, when deciding to share it (by email, social networks, etc.) copies the visible URL in their browser or using the native “sent to” option. The URL would be like http://www.google.es/amp/s/randomtrip.es/barco-flores-lombok-komodo/amp/ (you can’t access this kind of URL from desktop – you will be redirected to the original one. You can access it from a mobile device). 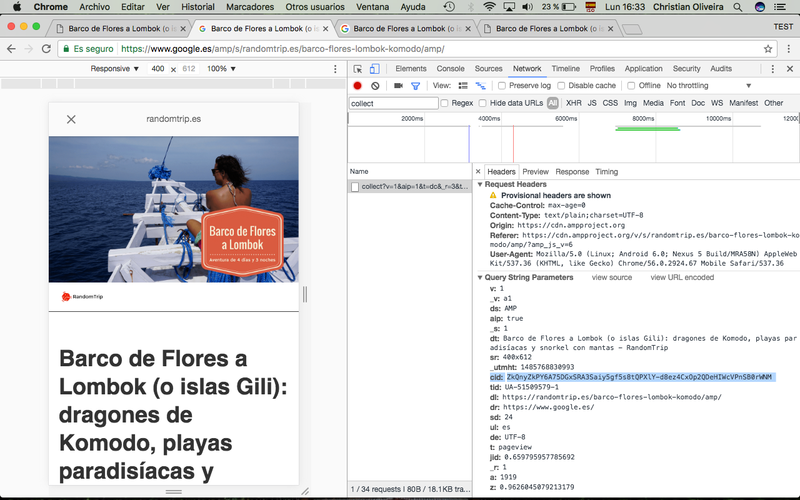 In this case, we are in the google.es domain, and the clientID value is saved in the LocalStorage. In this case, we are accessing a environment where a clientID already exists, so it is used and we are the same user we were in the other interaction. So: the clientID generated in the case 3, will never be used again, because now the one generated in the case 4 will be the chosen one for both cases. Depending in the order of interaction of the user with our website, both will be generated or not, and we will have more or less duplication of “unique visitors” and visits. 6. User access AMP version through a third party app: There is one last case, that is starting to appear now, which is third party apps. LinkedIn, Pinterest, Flipboard… are already including AMP version on the links shared by anyone inside their platform instead of the “common” ones, directing the traffic directly to the Google AMP’s cache URL (cdn.ampproject.org or yourwebsite.ampproject.org), which would be same as case 4. As you can imagine, the consequences of this “errors” regarding analytics are that lots of metrics inaccurate, so we need to be careful when we analyze data if AMP traffic is involved. Unique visitors: as we have just checked, a user accessing from the same device, using the same browser and withouth deleting cookies, can be counted as up to 4 unique visitors depending on how he/she access our AMP pages. Sessions: if a user visits an AMP page, in any of the environments and leaves, there is no problem in terms of sessions. But, if he continue navigating our website, from the AMP page to any other non-AMP page on our website, apart from being counted as a new Unique Visitor, a new session is started, so it is counted as two sessions. Bounce rate: due to the previous reasons, when a session is divided in two, the first session would have only one pageview (so it will be counted as a bounce). The second session, if it only checks one page, would also be considered a bounce. So, the bounce rate will be increased incorrectly (the complete session should not be considered a bounce, but it ends being two bounce sessions). And this happens both for AMP and non-AMP pages. Pageviews per session: also in consequence of the previous reasons, instead of having 2 pageviews/session, we would have 1 pageview/session. These are the most common metrics directly affected. As you can imagine, as these ones are affected, so are most of the rest, as most of them depend on these ones to be calculated. For example: in an e-commerce, if a user enters our website through an AMP page in Google and ends buying something in the same session, the sale would be attributed to the “second user”, and the source of that visit would be “Referral Traffic”, instead of “Search Engines”. How to avoid Analytics duplicating users with AMP? Luckily, a solution exists, to avoid clientIDs to be different in any of these cases. The solution is technically complex, but feasible. It is only valid for the data collected after its implementation, not for the already collected data. It’s unbelievable that Google hasn’t done anything yet to fix this situation (neither they did with the Spam problem in Google Analytics), when AMP has been live on the SERPs for year. In the amp-analytics component configuration, you can define that before sending the data to Google Analytics servers, more configuration information should be obtained from an external URL. Contrary to most of the AMP resources (which Google cache on their servers and serve them directly), this petition to this URL is not cached, and it is performed every time the page finishes loading, from the client, while the page keeps the focus. As the petition is to a URL from our own domain, cookies from our domain are sent, so the proxy just checks if the _ga cookie exists, and if that’s the case, gets the clientID value from it to return it to the client. The client receives the “correct” clientID and sends the information to GA servers. Besides that, the _ga cookie must be updated the same way Google Analytics normally does. It’s not an official solution, so this can lead to problems in the future. Doesn’t work on Safari, when accessing the content through Google’s AMP cache. What happens with historical data? If you manage to implement the previous solution, it will just fix the problem after the implementation is done. The data you already have in your Google Analytics would still be wrong. As sessions who navigate inside an AMP page end on our website, we have them controlled: they all are under the “Referral Traffic” section, from cdn.ampproject.org. 110 visits (11%) were not bounces, as they visited several AMP pages in the same session. 200 visits have been considered bounces, but they are not, as they come from your AMP pages. So, you have 310 visits which were not bounces. Based on this, you can try to do the same with other metrics. We’ve just checked that the same “unique visitor” ends up being counted as up to 4 unique visitors due to how AMP works, generating wrong metrics in our Analytics tool. Worst thing is that maybe you didn’t even realize, and you may have been worried about the high bounce rate on your AMP pages. Ideally, Google will provide an official solution. By now, there is a task in AMP’s Github, but it’s been there for some months without any specific plans of being implemented. Besides that, if AMP adoption by 3rd parties continue growing, the number of unique visitors generated by the same device can grow even more. Have you tested this solution to unify client ID? I currently looking for a solution, running a couple of test and a lot of the documentation aims to the Simmo Ahava solution. I tested a little and the app always return me the generated value, not the cookie value. The only exception is when i have in the same browser the page open in other Tab. This is because the page aplication is not able to reach the cookie (due security problems). This even if my domains is over HTTPS and this. I tested on PHP (because the blog is over WordPress) . Now i tryng to do the same but in Node.js over Amazon EC2. I’m affraid that this solution is not fully working. Just for a very low number of cases (almost all when i open AMP in a browser not in an In-APP solution). Hi Kemen, and thanks for commenting! I haven’t tested yet but several people that did said it works fine! There is a caveat, it won’t work on browsers that do not support 3rd party cookies (e.g. Safari). But should work fine with the rest. When it first came out, I tried to install AMP on one of my new websites. Fortunately, it didn’t work. That got me lot of frustration because I couldn’t use this new ‘hot’ thing from Google. Now that I look at it, I guess, it was for good. I guess that the intention of AMP might be good, but it will bind the whole web to Google if it booms. That’s not good especially when Google already has the monopoly over Search.